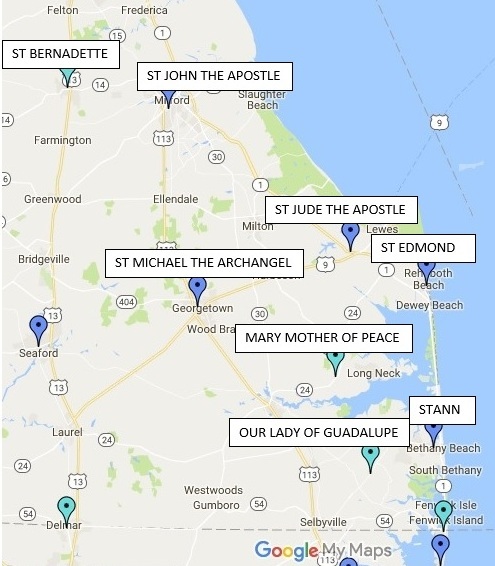 Click here for the Diocese of Wilmington interactive map. Saturday Evening in Church: 4:00 p.m. year round and 5:30 p.m. May 26 thru September 29, 2018. Sunday in Church: 7:30 a.m., 9:00 a.m., 10:30 a.m., and 4:30 p.m. year round. Sunday in Hall: 7:30 a.m. May 27 and July 1 thru September 2, 2018. This is a Quiet Mass with NO music. 9:00 a.m and 10:30 a.m. May 27 thru September 9, 2018. Sunday at Rehoboth Elementary School (500 Stockley St): 9:00 a.m. May 27 and July 1 thru September 2, 2018. This a Quiet Mass with NO music. Click here for a map for Rehoboth Elementary School. Saturday Masses: 4:00 p.m. Additional Saturday Mass at 6:00 p.m. during summer Sunday Masses: 7:30, 10:30 a.m. Additional Sunday Masses at 9:00 a.m. and 12:00 noon during summer. Summer Sunday Masses: 9:00 & 11:00 a.m. and 2:00 p.m. (Spanish) Other times of the year Sunday Mass: 9:00 a.m.
Saturday Mass: 4:00 p.m. Sunday Mass: 10:00 a.m.
Saturday Masses: 4 p.m. Sunday Masses: 7:30 & 11 a.m. Call the parish office or see the parish website for confession and daily Mass times.